More on High Heels: So What do you think of Flatforms? This article talks alot about the inherent dangers of very high heels, stating that 2 inches is a reasonably safe heel height for normal wear. The tightening of the calves can be balanced by daily stretches. I hope Lady Gaga hears that. But, this article also introduced me to the Flatform. I hope this can become a strong fashion trend. Looks safer!! Dr Ralph Dye, a podiatrist, invented a way of taping the arch which is called the Low Dye. The High Dye was his version of an ankle taping. Both of these techniques are widely used now 50 plus years later. This video demonstrates a version of the classic Low Dye used for a variety of foot complaints including plantar fasciitis, foot strain, metatarsalgia, foot arthralgias, etc. Lady Gaga May Need Our Help!! I must announce to the world that I love Lady Gaga's music. I was saddened today by the fact she hurt her foot and needs medical care. Her music videos must go on and I pray that her podiatrist/orthopod that sees her gives her great advice. The Gaga Show must go on!!!! She the article below. One of my previous posts linked below talks about the need for stretching when you live in heels. Hopefully Lady Gaga will not stretch through pain, since that makes the tendinitis worse. Also, if you are close to her, tell her not to do any negative heel stretches, feels great, but can tear fibres apart that are trying to heal. If you have other comments for Lady Gaga, post them on my blog, I am sure she will read it. Here is a good reminder article to move those legs after surgery or while flying long distances. Learn if you are a high risk for this: obesity, smoking, family history, diabetes, etc. I hope this video gives you an idea on how to self tape your ankles. You need prewrap, 1 inch and 1 and 1/2 inch white athletic tape. There are so many modifications that if you get the main idea of what you want to get accomplished, you do not have to do it exactly as the video. Hooray summer is here, I think?? Rain rain go away! 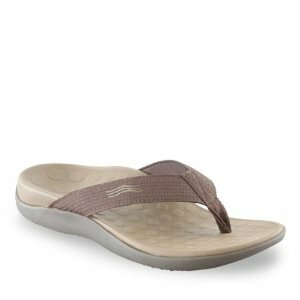 A great supportive sandal for this summer when your feet are craving sandals, yet support, is the Orthaheel Wave Flip Flop. See this product at footsmart.com and amazon.com Also, check out the post below on sandals that can fit custom orthotic devices. This video discusses the typical physical examination of a patient who may have Morton's Neuroma. This nerve problem is normally between the 3rd and 4th metatarsals and can be difficult to diagnosis and treat. Please see also the links below from other posts on this subject. Strengthening exercises for the foot and ankle are numerous with some helpful and some possibly harmful. I hope that these exercises will give anyone looking to strengthen their feet and ankles a good start. After 30 years of being a podiatrist, the word is finally out. People need to strengthen their feet and ankles. The video shows the basic program taught by our physical therapy staff at Saint Francis Memorial Hospital in San Francisco. Patients can monthly increase the number of sets and reps done, and change the exercises to make them more challenging. This is a great 3 to 4 time a week program when you know you should be building up the strength in these poorly often neglected feet of ours. Bunions produce instability in the foot that can lead to pain in the foot, ankle, knee, hip or back. They are a weak spot that need to be addressed, often times quite simply. What do we have at our disposal? Foot strengthening exercises, toe separators, foot orthotics, surgery, shoes, and taping. The video below will show you how to use taping of the big toe joint to stabilize a bunion. If you tape for a week, you may find some of your symptoms that you thought were separate from the bunion are actually related. I have links below to the foot strengthening exercises and toe separators. Hope you dont mind me dropping you an email, I have a query regarding your inverted device. On the website you make reference to marking the lowest point on the heel (on positive cast). 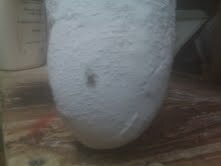 What exactly do you mean by this, is this the most convex point on the heel (fatty pad) when viewing laterally? Dear Declan, Thanks for your patience with my response. I hope these 7 photos explain. If not, please comment and I will give it another try. For those who do not know, I invented the Inverted Orthotic Technique in 1981. Most of my patients over the last 30 years are in some version of this technique, although Root Balance Technique and the Hannaford Technique are also used quite frequently. 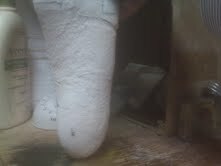 Here an uncorrected left foot positive cast with no forefoot to rearfoot abnormality is resting vertical on a platform. 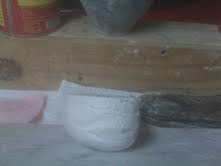 A grease pencil is used to mark up a surface and then the heel area of the positive cast is rubbed over the area with the foot being held vertical. Here is the mark that was transferred to the positive cast of the lowest point on the heel with the heel in a vertical position. Here is the same mark on the bottom of the left foot showing the more of the foot for better visualization. 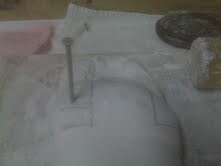 Here is this same foot with the anterior platform nail to set the positive cast to a 30 degree Inverted position. 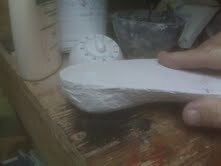 Here the left foot heel area of the positive cast set 30 degrees with the lowest point on the heel now moved laterally. Here the lateral mark is demonstrated (further right in the photo) by the same method above. Declan, I sure hope this helps. Rich Please send more questions about orthotic techniques. Following an Ankle Sprain, it is important to create a painfree environment. The keys components have been taught in High School and College Health Classes forever. Rest is a four lettered word to most athletes, but crucial in minimizing the re-aggravation of the ankle. Rest is created by whatever it takes to make the ankle painfree. This may be crutches, removable cast, ankle brace, limited activity, and/or completely getting off the foot involved. The first 4 days after a sprain is the most crucial time to chill out. Yet, since no one can really be sure 100% of the time what is wrong, the first 2 to 3 weeks following a sprain should be relatively painfree. Ice for 96 hours following a sprain is crucial. You can refer the previous link on application of ice below. Yet, ice is used for months and months in a typical sprain, it is just knowing when to use it. Compression is also crucial. The product seen in the video is Tubigrip, but a common substitute is an Ace Wrap. The secret to compression is to put more compression below and less compression above the ankle. This may require some tape of some type to hold on the wrap above the ankle. Make sure this tape is not wrapped all the way around. Elevation even 1 inch off the floor is very beneficial. As long as it is comfortable, and as long as there is swelling, try to elevate the foot and ankle as much as possible. Super Elevation once a day for 30 minutes is very important. Super Elevation is where you lie on the floor and elevate your foot on the wall or couch 3 feet above your heart. Combine this with compression and gentle nonpainful range of motion of the ankle and the swelling will improve the most. I saw one of your videos on You Tube and finally felt that I was NOT crazy. I hope you can help me. I had surgery on my left knee at the age of 8 to remove a benign bone tumor. Of course, as you can guess, my left leg is now longer than my right leg. I am 46 years of age and have suffered from a sense of clumsiness, no coordination, “can’t dance”, falling into walls and down stairs most of my life. (Dr Blake's note: surgery in a young child can either stimulate bone growth so that side becomes longer, or stunt growth so that side becomes shorter). I had an MRI of my left knee back in March, 2011 to check for medial meniscus tear. Thank goodness, there wasn’t one. Just a week later, my left foot swelled up and started hurting. I saw a local podiatrist right away. Had two sets of foot x-rays about 9 days apart to check for stress fracture. Again, none found. I was told I needed orthotics since I have a much shorter right leg. Wore a heel lift for about 10 days waiting for the orthotics (which I now know from watching your video is a NO NO!). My symptoms kept getting worse even after I got the much hated orthotics. They make my knees and feet HURT so bad even though I broke then in according to the schedule (1 hour the first day, etc.). (Dr Blake's note: heel lifts for the treatment of short legs is not the best way, full length lifts are much more stable. Also, you never need orthotics (some version of an arch support) for the treatment of a short leg, only lifts. The orthotics are for the treatment of something else and usually go in both shoes). The pressure from even a good orthotic on a swollen painful foot can be very painful. I have been in physical therapy for the past three weeks, but the pain keeps getting worse. I am being treated for weak ankles and now knee pain. The left inside of my knee is weak due to the right foot pushing out when taking steps, I am guessing? (Dr Blake's note: Orthotics and Lifts work the best in the Restrengthening Phase of an Injury. You, on the otherhand, are in the Immobilization/Anti-Inflammatory Phase. You are breaking the one of the Golden Rules of Rehabilitation: Create a painfree environment to allow healing to occur. You should be on crutches, removable boots, rest, etc, along with anti-inflammatory measures. 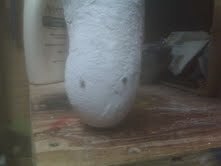 The lifts and orthotics will be important in a month or two. Get the pain under control. Read my post on Good vs Bad Pain). I’m seeing my local podiatrist this coming Friday and am going to tell him to “stuff” his stupid orthotics. They are causing major gait issues and compounding the knee, foot, and ankle instability problems. Apparently, I also have extremely flexible ankles which is not a good thing. (Dr Blake's note: They could be the wrong orthotic, but they may be just the wrong timing. Spend the time talking right now about getting the pain under control. Xrays are so poor at recognizing a more subtle soft tissue injury, discuss with him or her about getting an MRI). I am wondering if I can purchase one of those “3 step” sole inserts you showed in one of your videos. After watching your procedure, I am pretty sure it would make my life much less painful. (Dr Blake's note: see my You Tube video on Manufacturing of Full Length Lifts. I am happy to mail you 3 but first have the podiatrist review the video and see if he/she will make it for your short side. If not, it will be my pleasure). PLEASE, PLEASE, PLEASE help me. I don’t think I can live like this; I can’t walk, can’t exercise, and my quality of life has gone down the drain. Any information you can provide would be most appreciated. For the record, I am 5’5”, 149 pounds, and wear a size 7 or 7 ½ shoe depending upon the manufacturer. If you can’t sell me the inserts, can you please let me know where I can purchase them? 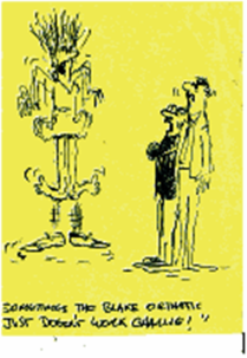 (Dr Blake's Note: You can always buy 2 pairs of Spenco Inserts in your size. Stand on each one and mark between your toes. 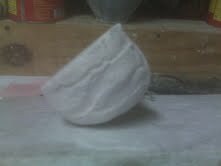 Cut out the toe area, since it is most important to lift the heel and ball of the foot only, and not crowd the toes. The third one will have to be a left flipped over (place that one on the bottom). Hands Free CPR: Effective and The Life You Save Could Be Very Important to You!!! Please check out this exciting new form of CPR which has shown to be helpful in preventing deaths. had gotten bad enough that she had to go into assisted living. She is pretty happy now. Before I had her hospitalized, she had been bipolar all my life, and it had caused a lot of problems for me. she has never been mean or angry once. I visit her daily, have her living near me, and we have become close and she is always kind and affectionate, even though her memory is shot and she often forgets I am her kid. away after a few weeks. I had worn Crocs the whole month in France. This past year I also wore Crocs the whole month, and the pain started when I returned. My doctor said it was plantar fasciitis and I saw a podiatrist who sent me to a guy who made me orthotics. They only seemed to make the pain worse, and I found it really hard to ice them often, especially after first getting up. I did a minimum of the exercises they told me about, but didn't go to the gym because it made it worse, especially the elliptical machines. I got the special shoes they told me to get and so far have had the orthotics adjusted twice, but now the pain is terrible in my ankles and above. When I go down stairs, I suddenly scream sometimes because the pain is so bad. I saw my internist while my podiatrist was away and he told me to stop using the orthotics which I have, but the pain is still there. My internist looked at my feet and said the plantar fasciitis problem is caused because I have hallux rigidus. He made me an appointment with my podiatrist to discuss surgery on each foot. I've been reading about the surgery and it sounds awful and not with very great odds of it curing the problem. Please tell me what to do???? I have pretty high anxiety because I am my mother's trustee and have a lot of responsibilities andit is very difficult to watch her getting much worse, and I am close to many people at her home because no one visits them, so I have taken them on as friends. I'm living on a teacher's pension which is pretty amazingly low. So I especially need to exercise to fight my insomnia and stress. These two foot problems are making working out hard, and I am due for my yearly vacation in July, because I need a break from Alzheimer's once a year or I start getting too depressed. I was planning to do the hallux rigidus surgeries in the fall if I have to do them, but I just read your article about not doing the surgery. How do I know what to do???? PS Is there anything that does not make sense when you are contemplating Hallux Limitus surgery, on the most important joint in your foot, when you have had no conservative treatment on it? Here the inside or medial or tibial (same name for the same bone) sesamoid appears broken into 2 pieces, but is it? Sometimes, these sesamoids never completely become whole, and they are in 2, 3, or 4 pieces. This can be there natural condition and can make the diagnosis of a broken sesamoid difficult at times. With this preclude, here is a recent email I received. Here is a fun one for you... debating on tripartite sesamoid vs. sesamoid fx. Personal history, I'm a 28yo female who is fairly active. I danced from childhood through college. Within the past year I have started running and completed my first half marathon on April 10, 2011. I am also a chiropractor who is on my feet most of the day and in various squat and lunge positions when I am adjusting patients. Needless to say, I'm hard on my feet. While training for my half marathon the only foot problems I had was blisters. After I finished my half, I had pain all over my feet, I attributed this to blisters (since I had SEVERAL). I did not run any the week after my half. I teach dance one night a week, and did not notice any unusual pain during this week. One week after the half I ran a 5K, after this I noticed some soreness under the ball of my foot on the medial side. This was mainly a pulling/stretch then I extended my toes. That following Thurs, I trained with a running group, and we sprinted hills. I pushed it! We sprinted up hill forward 5 times and backward 3 times. I'm not sure exactly when I noticed the pain changing, but a couple days later I realized that standing in releve' (on the balls of my feet) was unbearable (I could only stay there for about 2 seconds, typically it's doesn't bother me at all). Since then I have not ran, and I am very careful while teaching dance and adjusting. Since it is not getting any better, I have started to play around & look up more things. I have pinpoint tenderness under the fibular sesamoid, the rest of my foot is normal. When I passively extend my toes it hurts but not unbearable. If I flex my 2nd toe against resistance (while keeping my big toe neutral) I have intense pain right at the sesamoid in question. I have had to alter the way I adjust because one of my typical stances has my right foot in a lunge behind me, and can't get enough power from that foot due to the pain right now. (I'm just under 5'4", so I have to use my entire body to adjust some of my patients.) Tuning fork on and around the affected area is negative. I have attached 2 different pics of the AP x-ray. I apologize they are not the best pics. Due to the fact that tripartite sesamoids are typically bilateral, I will take a XR of my left foot to check that. (I have to get back to our main office to take the x-ray.) Other things I have came across are that bipartite and tripartite sesamoids are typically on the medial sesamoid, while mine is on the lateral. I do have some other congenital anomalies in my spine, so having them in my feet wouldn't surprise me. I have been icing, trying different taping, and not working out. (However it's not getting any rest when I'm working.) I did your kinesiotaping this morning, however it really didn't restrict my big toe extension. Any suggestions? While researching this topic, I came across your page, and decided I'd share with you my story. Have a great day! Tiffany's lateral or fibular sesamoid appears to be broken, but is it? The question drives radiologists and doctors crazy at times. Tiffany, Thank you for the great email. Yes, it is a complicated question? Tripartite or broken? But what about both? You can break the cartilaginous bond between the sesamoids and it must be treated as a fracture. You can break the fibrosis bond between the sesamoid pieces and it must be treated as a fracture. You must treat the most dangerous possibility, because all docs live with patients that the misread the sesamoid injury, thinking it was just bipartite or tripartite, and were wrong. These end up needing surgery, which could have been avoided. These may end up with some disability, which could have been avoided. My protocol now, and it has taken me 30 years of practice to get here, is to get a MRI of possible sesamoid fractures. If this is still questionable, then get a bone scan to look for hot spots. If this is still questionable, get followup xrays in 6 weeks. Fractures tend to show a changing pattern in the bone, even on xray. 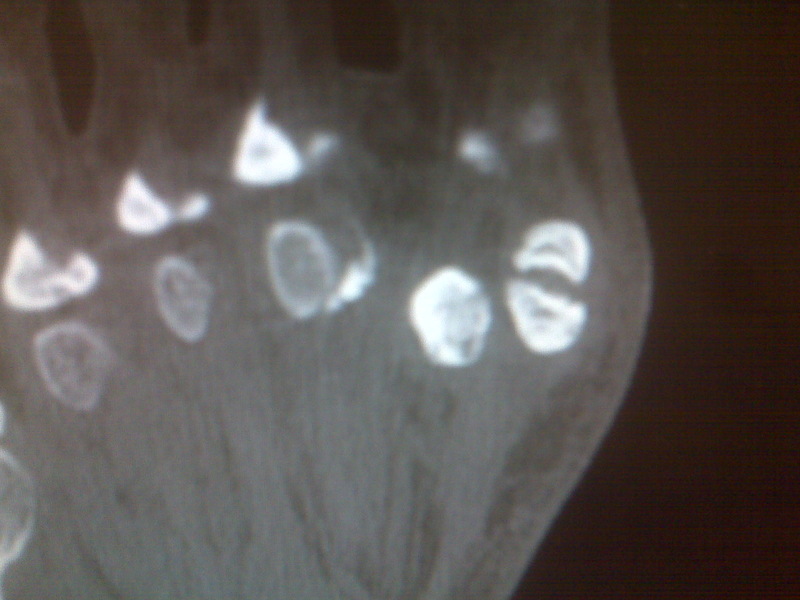 Since it is the fibular sesamoid, get an Oblique and Plantar Axial xrays which show it well. Tiff, you have a classic pattern on long 2nd metatarsal. Are you sure it is not the lateral capsule of the 2nd MPJ that is injured? Please please email any photos of subsequent tests you get. I'm going to preface my question with a thank you that you have probably received many times in response to your blog: "I'm so glad I found your website!" Thank you for presenting your knowledge to people in pain, searching for answers. I wish I lived in California so I could come see you directly and get some help! Instead, I wonder if you'd just tell me what my next steps should be. I have a Morton's neuroma. I've probably had it already for a year. The first time I went to the podiatrist, she thought I only had a collapsing (hammer?) 4th toe and prescribed the purchase of a soft gel cuff to cut to size and wear on the toe when exercising. This I did. And it did help a little, even though the area still felt numb. About a year later, I was back, this time the pain having become so acute that I couldn't even walk my dog around the block without hobbling. She did another exam, heard the clicking and pronounced the neuroma diagnosis, and told me that immediate care involves 3 cortisone shots. If that doesn't work, excision or chemical killing of the nerve. So, not knowing any better, I had 2 shots (I don't know one type of cortisone from another, so I'm afraid I can't tell you what it was), each of which relieved the pain entirely for 1 month. At the end of the 2 months, I woke up one day with a pain on TOP of my foot, and a bright red bruise, slightly below the point where the foot bones come together at the top of the foot. For this she took an x-ray because she suspected a fracture -- but she couldn't find any fracture. She prescribed a pressure boot anyway, so I wore that for 6 weeks (!!). Even when she re-x-rayed she did not find any evidence of fracture, but insisted it was not related to the neuroma. Of course everything felt better in the boot because the foot was immobilized, but now that I'm not wearing it, the foot hurts again, this time both the neuroma and the ankle hurt -- I think because of simple weakness. So now, with that secondary pain healed, we are back to treating the neuroma. Her chosen course of action is immediate surgery. My first reaction was to say 'no', but of course it is very painful. I happened to mention the condition to an MD friend of mine who is in family medicine and he says he never prescribes surgery first thing but rather starts off with metatarsal support. What?! I asked myself, NOT surgery? He said surgery is only needed in about 20% of cases! I was surprised, so I began to do a little Internet searching. The first thing I found was that most websites agreed with my DMP's traditional course of treatment -- they describe neuromas more of less popping up out of nowhere (or from high heels, which I don't wear, I wear things like Danskos, Birkenstock, Think, and Nikes, and hiking boots and Uggs in the winters here), and being treated with cortisone or surgery. Then I happened across your blog and for the FIRST time I read that my neuroma might have other causes that could also be addressed and that I could start first by trying some other things before resorting to surgery. You write that it might have something to do with sciatica or ankle problems... well I had broken both bones in my ankle on black ice (--Minnesota!, in the spring of '05) and have 9 pins holding it together! About a year after that I had some physical therapy for pain in my left SI, which improved a lot after treatment but has never gone away -- I just live with it because it isn't debilitating. Is it possible that the ankle is causing both the SI pain and a neuroma that is also possibly treatable?! Your website was a huge relief to find. *I read on your site that there are some things I can do first to self-treat -- so first I went out and got a metatarsal support (I could only find one kind at the clinic's shop, there is nothing at Target or Walgreen's, so I may have to go online, but at least I found one pair I can use in the immediate term). That helped quite a bit right away, I tried it on a short walk with the dog and there was only numbness but no burning sensation. *I stopped going barefoot in the house but now wear my Birkenstock clogs as slippers. *Should I try alternate warm-cold foot baths even though my injuries are not recent? *Should I try Neuro-Eze (again, I'll have to order), even though my pain is not constant, but only hurts when walking? *What would YogaToes do for this, anything? But here's my biggest question: Who do I see to analyze my gait? I don't know if I pronate or supinate, I can't see it. I don't know if my ankle function is harming my nerve- - I do know that when I tried some of your exercises for foot strength, I realized for the first time how small the range of motion/stretching is in my previously injured left foot. Could that be contributing my neuroma and my SI pain? I guess what I'm asking is if I've already been to a DPM and she insisted that the neuroma had nothing to do with my previous ankle surgery, who can I ask about my gait and who can I get to help me treat the neuroma? I thought I was going to a reputable clinic here, it's large and has a great reputation but I don't know who I would need to see now....and if not a DPM, then who? Thank you for your time, thank you for your blog! How can I repay you for the hope you have given me that I might be able to get this condition under control and better yet, perhaps even address any underlying cause?! Thank you so very much for your kind words. Your questions are all valid ones, and most doctors gradually learn all the treatments available for certain injuries (sounds like your doc is early in the learning curve, which is okay and no slight to her, just her reference point right now). In todays medical world, you do have so many choices in treating that surgery should be the last resort. If you want to try to avoid surgery, and surgery is done on less than 1-2% of our neuroma patients, you need to get 3 or 4 opinions from podiatrists and find one that is willing to team up with you. I do not know where you are at, but asking around for a conservative podiatrist is a start. If you are in the US, you can go to the website of the American Academy of Podiatric Sports Medicine (http://www.aapsm.org/) and check for local members.You need someone to analyze your gait and design orthotics to stablize that gait and off weight the neuroma. Without that, you will need surgery. But the orthotics are more important after the surgery than before for many reasons, so you have to have orthotics even if you are going to have surgery. Shoe stores, running clubs, and physical therapists may give you a recommendation for a podiatrist. And if that fails, start checking into physical therapists and chiropractors that make orthotics. If you email your city, I can help find a doc if you are having trouble. But, in the end, you will have to go to the appointment and find out if they want to play on your team. One of the best things you said is that the cortisone shot lasted for 1 month. That really has made the diagnosis of Morton's Neuroma, which can be 1/4 of the battle. Now that you have identified the nerve problem, see a physiatrist or neurologist, to see if the neuroma pain is from a local nerve problem or from your ankle, lower leg, or back. Some podiatrists are good at that, but it is the world of a MD specializing in nerves. Why do neuromas hurt? They get pinched between two bones and treatment needs to separate those bones. The met pad was great proof of that. Go to http://www.hapad.com/ and order small longitudinal medial arch pads with adhesive backing. See my posts on Hapads. I love them. Have them in all your shoes just behind the sore area. The irritated nerves hurt more because the body tries to heal them. Your body floods the area with inflammation, and the swelling next to the nerve hurts. Three times a day you should ice or contrast bath over the next month to reduce the inflammation. You will definitely feel better. If you do, keep doing it. Ice 15 minutes on a ice pack, or do the full 20 minutes of contrast bathing. It all depends on your time and what makes you feel the best. Have your primary doc put you on an anti-inflammatory drug 10 days on, 4 days off to rest your system. You may have to go through a few drugs to find the one that makes the nerve feel the best. The video above has two basic parts to it. The first part is the stretching part. As long as the heel is on the ground, the stretch is safe and should produce excellent flexibility. The second part however is the strengthening part. This is very risky since a Negative Heel Effect is created when the heel comes off the ground. Negative heel is when the front of the foot is higher than the heel. This is a very unnatural position and definitely the cause of many injuries. Avoid at all costs. The same exercise starting with the heel and front of the foot at the same level is much safer. Hemoglobin A 1c is a great marker for Diabetes. Over 5.6% in laboratory testing means the patient probably has diabetes, so it is one of the best lab screening tests for this terrible disease. For our Diabetic patients, we need them to own their number and we desperately try to keep it below 7.0. Over 7.0 and healing goes way down. Read the short article summary above and get tested if you have a family history of diabetes, have sores that are slow to heal, get chronic infections somewhere in your body, are constantly thirsty, and/or have frequent urges to urinate. The test results just could save your life. I want to thank Dr Carl DiRaimondo for pointing out that Achilles Tendon Ruptures can be treated non-surgically. I have rehabed about 100 complete achilles tendon ruptures without surgery and another 50 or so surgically repaired. Both have there pros and cons, but both types of repair can be rehabed to 100%+ strength. Both groups seem to start running between 6 and 9 months. Both groups can have failures requiring further surgery. The failures in the surgical group are much more dramatic due to surgical complications. The main complications in the nonsurgical group are re-rupture and inadequate reattachment. Both can be fixed with the surgery in the future. There is quite a bias in the world when achilles are ruptured to fix them surgically. They are sent to surgeons from the primary care docs or from the ERs. Only the articles like these can make someone stop and say maybe I could treat this injury without surgery. After one year, whether the tendon was surgically or nonsurgerically fixed, there really is no difference in function. If you are surgically averse like me, and unfortunately you have a problem like this, consider a non-surgical approach. I would be happy to send our protocol to anyone on the non surgical rehab of achilles injuries. When I make decisions in life, I like to write up a pro and con list to help me see the whole picture. In compiling my list, I may talk to friends, family, or expects, read, watch video, etc. Here is a my pro anc con list for Barefoot Running. know how to treat them. So,Doctor, what is your opinion and advice for my case? I am tired of spending hundreds of dollar to cure my problem.I really need to get back to my normal life.I am still young,23 years old. If you know any reliable person in Sydney (eventhough you are in the US) who can assist my problem,do let me know. I hope to get a reply from you soon. Dear Suffian, You definitely sound like you have structural short leg, but it could be functional from a scoliosis. Ask your GP to order the Standing AP Pelvic Xrays mentioned in other posts. Look up a sports podiatrist from your city from the Australian Academy of Podiatric Sports Medicine. Once you have determined whether you have a short leg structurally or functionally let me know.